Gareth Morgan couldn't decide whether he believed in climate change or not, so he hired the best international scientists to answer his questions and these are his findings. 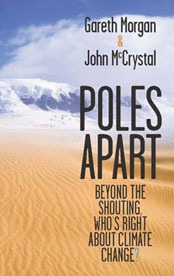 Combined with anecdotes from his own recent trips to Antarctica and the Arctic this is something completely unique in books about climate change - somebody who has approached the topic with an open mind, somebody who has the resources to explore such a topic and somebody who has personally investigated all of the issues. So what was his conclusion? Read the book to find out. In conjunction with excellent researcher and writer Dr John McCrystal, this is an accessible and fascinating exploration of one of the biggest topics of the 21st century. This book defines climate change, explains the science of taking the earth's temperature, looks at the respective cases of the alarmists and the sceptics, examines the anecdotal evidence and the politics of this dialogue, and then comes to a conclusion based on all this research.